This cake looks reasonably unassuming from the outside. My favourite type of cake: the kind where the main feature is hidden from view. 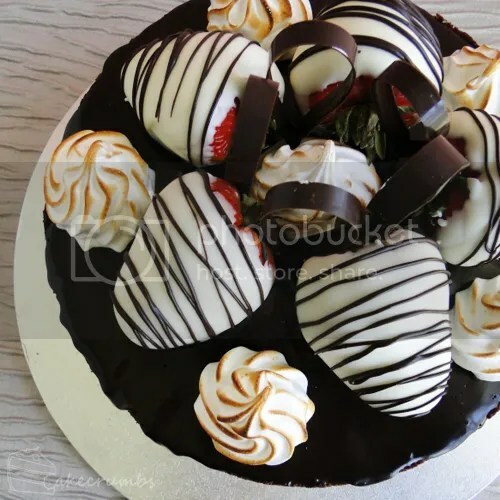 One thing I knew this cake just had to have was strawberries. Whilst grocery shopping the week prior I grabbed a punnet of strawberries, as I do. We were shopping at a supermarket some half an hour from where I live, one we had never been to before. The entire complex was half built and the shops were really new. The supermarket had that lovely "we've just finished building this and really care about everything being perfection" thing going on. The fruit and vegetables looked much fresher than I'm accustomed to seeing at home. I always shop at the fruit and veg shops for fresh produce instead, but this place compelled me to grab everything from the one place. But these strawberries. Let's talk about these strawberries. They were the most enormous strawberries I have ever seen. In a 250g punnet there were 6 of them. They were too amazing to just eat. I had to put them on some kind of dessert. And so I saved them for this cake. They're so huge they make the cake look a lot smaller than it is. 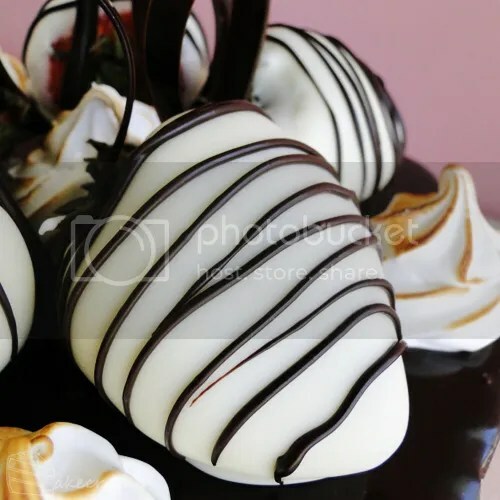 If there's one thing I love more than strawberries, it's strawberries and chocolate. Admittedly, I prefer them with melted chocolate, but I can settle for the chocolate being set. I dipped them in white chocolate and piped a little dark chocolate over them. By the time I'd squeezed the strawberries on, there was little room left for the Swiss meringue. But I managed to squeeze on a few dollops. 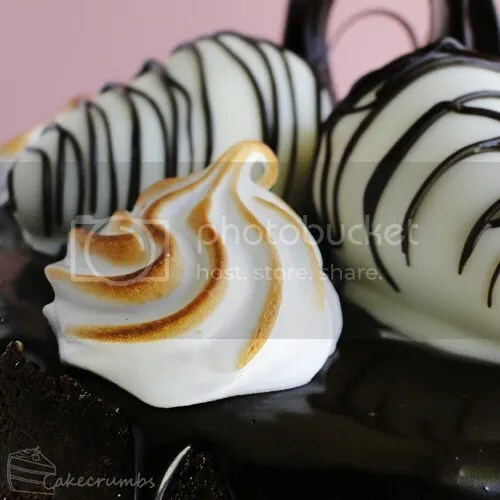 Then ensued the acrobatics as I used a blow torch to lightly caramelise the meringue whilst not melting the chocolate on the strawberries. 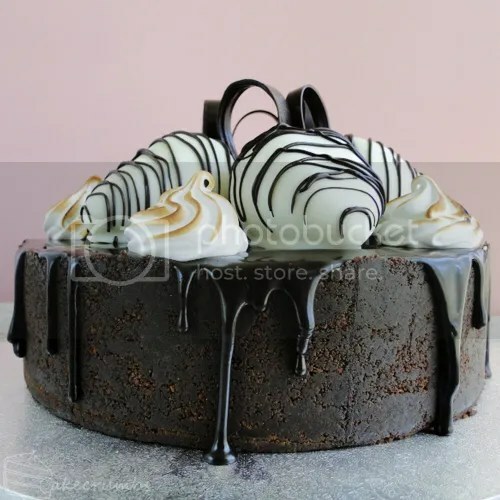 The outside of the cheesecake is made from chocolate ripple biscuits. They are my absolute favourite biscuits to use in a dessert. The flavour is so distinct and unlike any other chocolate biscuit. They always make for a delicious cheesecake base. The cake is topped with chocolate ganache, which I allowed to drip over the sides a little. But the best part is when you get to cut it open. The bottom layer is a layer of salted peanut caramel. There's a thin layer of dark chocolate between that and a layer of white chocolate cheesecake. Grease and line a 6cm-deep, 22cm wide springform tin with baking paper. Process biscuits until finely crushed; add the butter and process until well combined. Place the mixture inside your springform tin and, using a straight-sided glass to aid you, press the mixture firmly over the base and side of the tin. Chill in the fridge. To make the salted peanut caramel layer; stir the sugar and water in a large saucepan over low heat for 5 minutes, or until the sugar is completely dissolved. Bring to the boil. Boil, without stirring, for approximately 20 minutes or until deep golden. Remove from heat; stir in the cream. Place the pan back over medium heat. Cook, stirring constantly, for 2 minutes, or until combined. Set aside for 30 minutes to cool, then stir in peanuts. Pour into the cheesecake base, ensuring surface is even. Refrigerate for 3 hours or until firm. Melt dark chocolate and extra butter together; spread over caramel to cover. Set aside until firm. To make the cheesecake layer; Place the tepid water in a heat proof jug, sprinkle the gelatine powder over the surface. Stand jug in a pot of gently simmering water and heat, stirring, until gelatine has dissolved and mixture is clear. Set aside. Melt the white chocolate; set aside. Beat the cream cheese, sugar and the cream until smooth and well combined. Add the white chocolate and gelatine mixture; beat until well combined. Pour cream cheese mixture into the cake tin; smooth surface. Cover with plastic wrap and chill in the fridge for at least 4 hours. 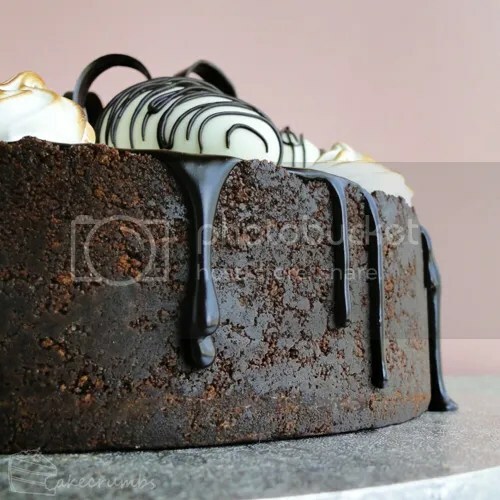 To make the chocolate ganache; heat the cream and dark chocolate in a pot over medium heat until chocolate is melted and mixture is well combined. Remove from heat; stir in butter until combined. Pour over the top of the cheesecake. Leave to set for approximately an hour, then decorate cake as desired. I wouldn’t describe the uncut cake as unassuming. I would describe it as stunning! Wow! And then to cut into it and find all that gooey caramelly nutty goodness. Oh just WOW! I REALLY want to eat this! I think I might make it for Christmas. Thanks so much for posting, def going in the bookmarks! Thank you so much. You’re so lovely. ♥ I hope it turns out well for you! Wow, that decoration is simply amazing! And the slice looks sooo yummy. I made it this past Easter after drooling over it on the cover of the Australian Good Taste magazine. Oh my goodness it was amazing! Ahh, that must be where the original recipe is from! My partner’s sister-in-law passed it on to me. 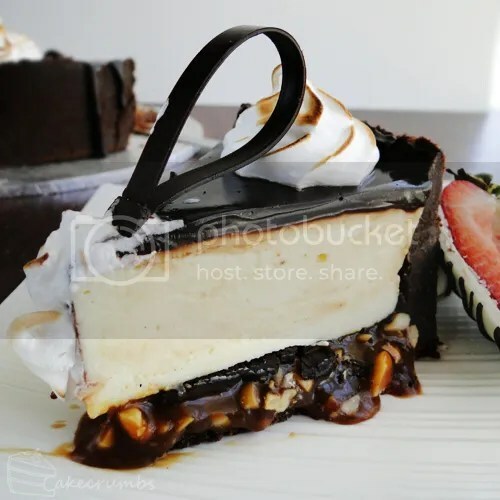 How did you find the cheesecake consistency? The recipe had a bit more gelatin than I would usually use so I wondered if it would be a bit too set or chewy with the full amount. The cheesecake was a bit more set than I would normally expect, kind of like the custard pies I remember eating as a kid. Next time I make it I’ll definitely use less gelatin but to be honest, I don’t think anyone else noticed but me. It was seriously delicious. Another amazing cake made by you. So much detail in this. The photographs came out really well too. OH MY GOD. I came here to comment on your Daring Bakers challenge but got totally sidetracked by the AMAZING cheesecake. It sounds absolutely delicious and looks like it was made by a pastry chef. Just… wow. *blush* Thank you so much. You are ever so kind. 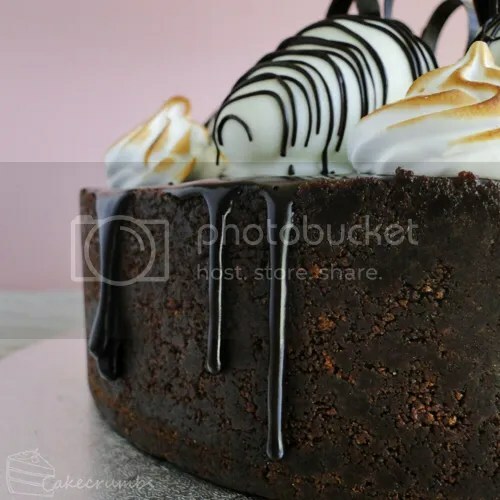 I want to try to make this for my boyfriends birthday, but I haven’t been able to find double cream or thickened cream in shops here. Do you have any suggestions how I could replace those? Would regular whipping cream work? All that said, you should be find substituting any sort of ‘normal’ cream. I’ve made salted caramel with thickened cream (which is what I believe is what you call whipping cream?) and pure cream before and there’s not a great deal of difference. 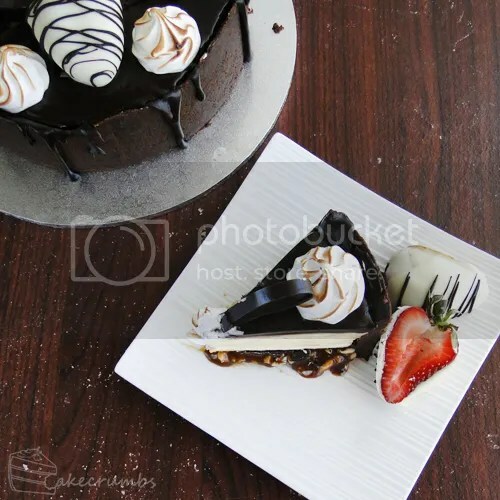 Double cream gives a richer flavour but the cake is packed with flavour so I doubt you’ll miss it! I’m located in the Netherlands. The highest fat content cream I’ve found is pure cream with 35% fat, so I’ll try that after I check the stores I haven’t yet been to. Thanks for your answer! I managed to find a specialty store which sells double cream! Yay! Another question: would I be able to replace the gelatin powder with gelatin leaves? (Stupid stores here have nothing! It took me 4 supermarkets to even be able to find chocolate cookies..) The leaves I have are around 1.7 grams. You can definitely use gelatine leaves but the reason its tricky (and the reason I don’t list it in recipes even when I use it) is that there’s no international equivalent. You’ll find different strengths (gold, titanium, silver and sometimes even white) and between brands the set of each will differ. So to sub it, you basically need to work out the volume of your mixture then follow packet directions to work out how much you need to use. I used the leaves and I think I’d use a little less gelatin next time but omg, this is the most delicious thing I’ve ever eaten! Boyfriend was very, very happy, haha. I’m glad it turned out well for you! It can be such a tricky thing, gelatine. It can take a bit of practice to get right but eventually you’ll get a feel for exactly how much you need.